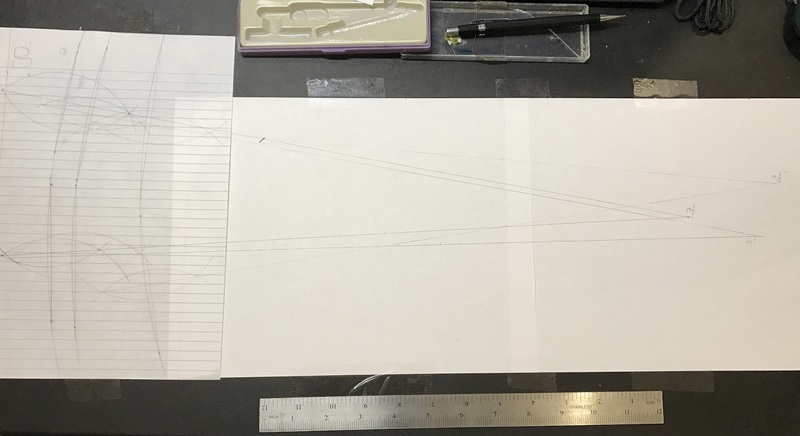 Small Scale Track Fabrication Team: Week 9: Back To The Drawing Board? Work over the weekend showed that the 1:1 die for the bender did not work, matching the results of the calculations shown in last week's presentation. Using the calculated die radius of approximately 10.4" for a 20" bend for our material will be attempted this coming weekend. If the bends cannot be created as intended, other analyses will have to be made to determine the necessary path forward. The corners of the track from previous year was measured and had an average of 20.63" radius. The radii was considered consistent except one of the aluminum had a reading of 22.6" which is higher than 10% error. This error is big enough to have the bogie get stuck of fall off the track. The data showed that previous team probably did the bending by hand and did not have a consistent bending machine that serve their purpose. Each curve was measured 3 times at different locations and averaged.